Vincent Price invites you to a party. Are there balloons and noisemakers and a clown? Gee, I hope not. No, but Price does invite a bunch of total strangers, a creepy housemaid, and a scaaaaary skeleton. Ahhhhh!! Millionaire, Frederick Loren (Vincent Price) holds a birthday party for his wife, Annabelle (Carol Ohmart) in a spooky mansion. For those of you playing at home, that mansion is Ennis House designed by Frank Lloyd Wright. If his guests can stomach a night in the spooky house, Loren will pay each of them $10,000. That’s about $81K in 2015 dollars. A nice payday. It sounds simple enough until we learn that several people, including Watson Pritchard’s (Elisha Cook, Jr.) brother were murdered in the house. Funny thing though, they never found his head. A building from Wright’s pueblo pyramid period. Just when we think we’re watching a straight haunted house film, Loren and his wife go at it. The couple do their version of Who’s Afraid of Virginia Woolf and it’s clear this party will end badly. Loren, you see, has had three wives before Annabelle and each has expired under mysterious circumstances. Hmmm. Annabelle confides in guest, Lance Schroeder (Richard Long) that she fears for her life. Her husband, she says, wants to kill her and he’ll stop at nothing. When the servants leave prematurely, locking the party-goers in for the night, they’ll have to contend with ghosts and spirits and a possible murderer among them. Vincent has the coolest party favors. Robb White, frequent William Castle collaborator, wrote the screenplays for House on Haunted Hill, Macabre, The Tingler, and others for the great showman. Castle directed this movie and filled it with piercing screams, an active skeleton, and a rolling old lady. Supposedly, Alfred Hitchcock saw Castle’s big box office returns and decided to make Psycho. Then, Castle saw Psycho and decided to make Homicidal. I hope that’s true. Anyway, we win. All three films are horror classics. Oozing charm and menace, Vincent Price does his best Vincent Price. The rest of the cast hold their own, but are nothing to write home about with the exception of Elisha Cook, Jr. His crazed, drunken ramblings about ghosts and unseen forces are appropriately over the top. Alan Marshal, Carolyn Craig, who might win an Una for screaming artistry, and Robert Mitchum’s big sister, Julie round out the players. Julie Mitchum’s claim to fame in this film is that when offered a drink, she always asks for a scotch and… A scotch and what? Motor oil? Drain cleaner? Mare sweat? It’s an odd thing, but it always strikes me as funny. 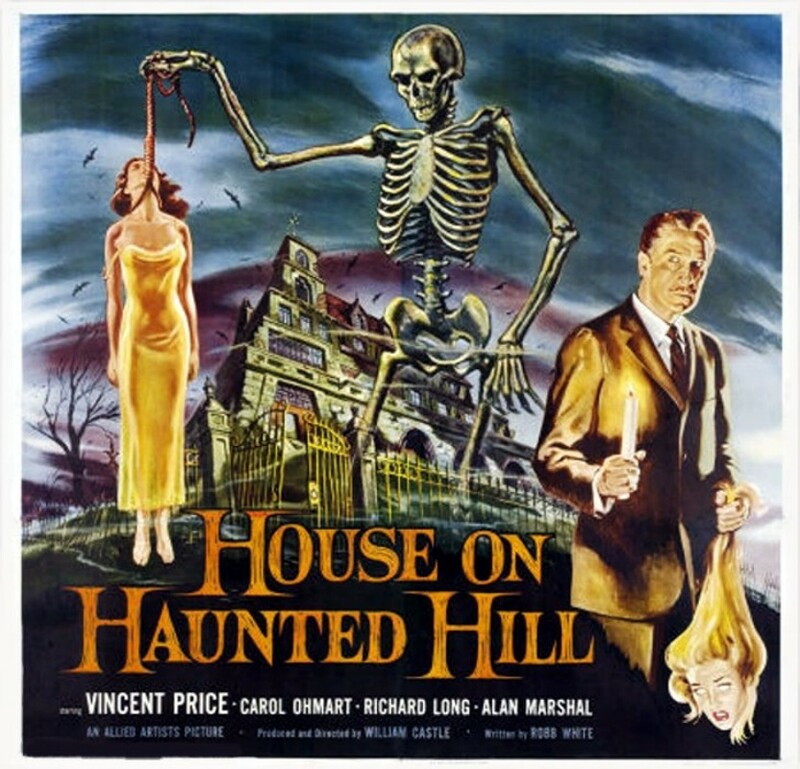 Ever the marketing genius, William Castle used this tagline for House on Haunted Hill. ‘First film with the amazing new wonder EMERGO: The thrills fly right into the audience!’ I wish I had been around to see a Castle film in the theatre. Flying skeletons, fright insurance, cowards’ corner…such fun. By the way, does anyone know a good acid vat installer? The next time I order a drink, I’m asking for Scotch and mare sweat! Which should get odd looks, especially if I’m at Dairy Queen! 🙂 Love this film and I also adore William Castle. His sense of showmanship and his gift for making a cinema visit an Event are mostly lost arts these days. When I watch ‘Matinee’ in which John Goodman plays a very Castle-esque character, I long to see the entire movie-in-a-movie he’s promoting, ‘Mant!’, based on the clips of it we see in the film. Thank you for a great review and for captions that always make me chuckle. Time to watch ‘The Tingler’ DVD once more!